As an Emergency Medicine resident, I use bedside ultrasound daily and am always looking for ways to improve my technique. Tools for bedside teaching are also helpful to share with new residents and medical students that are just learning to use ultrasound. Recently, I reviewed SonoAccess, a free iPhone App with extensive ultrasound education multimedia that I think is ideal for self study. 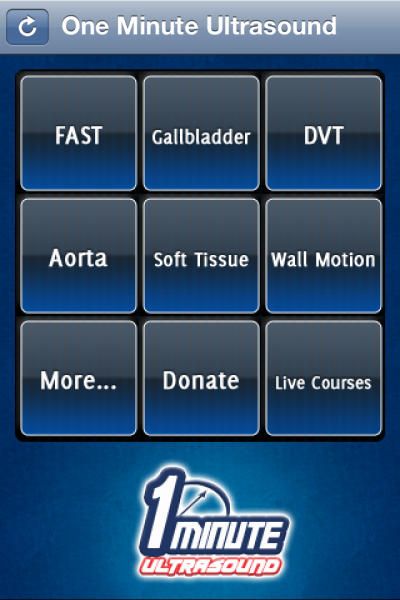 Today I’m taking a look at One Minute Ultrasound, another free app for iPhone or iPad. One Minute Ultrasound was created by the folks behind Ultrasound Podcast – Matt Dawson and Mike Mallin, who are both Ultrasound Fellowship trained Emergency Physicians. This app offers six one-minute tutorials on common bedside ultrasounds: FAST, gallbladder, DVT, aorta, soft tissue, and cardiac wall motion. Each tutorial consists of a narrated video with multiple windows. The main video shows how to position the transducer anatomically to obtain the correct images. 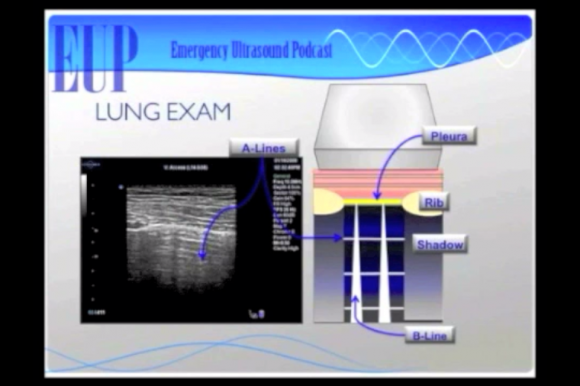 Overlying videos show real time scans that demonstrate normal and abnormal physiology with helpful annotations. The main videos are stored directly on the phone, so no wireless or cellular connection is required. In addition to the six rapid review videos, One Minute Ultrasound provides links to more comprehensive content. 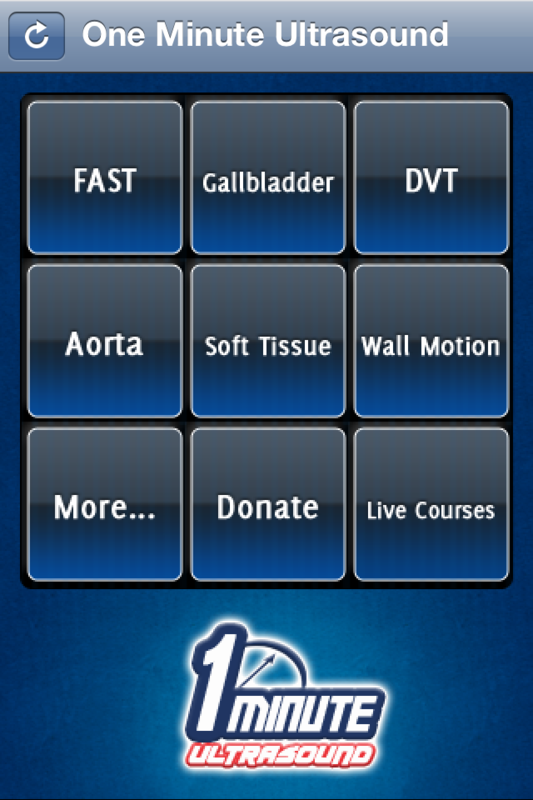 The app has eleven more rapid reviews on topics from intrauterine pregnancy to cardiac output. These extra videos are not stored on the device, but are accessible using an internet or data connection. The app also links to the creators’ Ultrasound Podcast with over 30 comprehensive multimedia talks, each about 30 minutes long. The videos in One Minute Ultrasound pack a lot of information into one screen. They work on an iPhone, but scale up much better on the larger iPad screen. The short videos can be easily integrated into clinical teaching in the ED. For example, an ultrasound beginner with limited bedside experience could realistically review the forty-nine second video on the FAST exam before doing the scan. If I’m teaching medical students about ultrasound findings in skin infections, it’s incredibly easy to pull up the video to demonstrate ultrasound findings in cellulitis, abscess, and necrotizing fasciitis while I’m setting up for the exam. One Minute Ultrasound excels by offering educational materials for a heterogeneous group of learners. The six minute review of basic scans are useful for beginners, while the comprehensive podcasts are great for more advanced learners. All materials are written by clinicians, for clinicians. They focus on learning objectives that are readily applicable at the bedside. Rapid review of most common ED bedside ultrasounds demonstrating technique and review of anatomic windows with examples of normal findings and abnormal ultrasound findings. Comprehensive content appropriate for learners at different levels. Just video. Brief text descriptions of the videos would be a useful adjunct. Physicians, residents, medical students, physician assistants, and nurse practitioners learning bedside ultrasound technique. One Minute Ultrasound provides a comprehensive, rapid review of scanning technique and clinical interpretation for common bedside ultrasounds performed in the Emergency Department. This format is useful for bedside teaching and self-study. Price – 5 – Free! Real world applicability – 4 – Quick videos stored on device are useful as a tool for bedside review. Text descriptions would also be helpful.